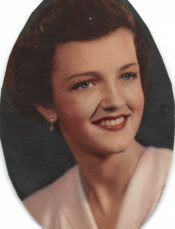 Mamie Grace Keller, 86 went peacefully on March 21, 2019. She was born and raised in Bush, Louisiana. She resided locally for 48 years and retired from Gulf Coast Specialties. She was preceded in death by her parents, James Ellis McLain and Ethyl Taylor McLain; Brothers: Alvin, Alton, Jim, Freddie (Lawrence) and Sydney. Sisters: Joyce Gay, Essie Cleveland, Mavis McManus. Husband; Preston Griffin Keller and son Preston Griffin Keller, Jr.. She is survived by her children: David Keller (Felicia), Danette Moore, Christopher Keller and Kevin Keller; 12 grandchildren and 6 Great grandchildren, many Nieces and nephews and brothers; Eugene, Raymond, Donald, Laverne, Stanley, Stephen and sister; Betty Ann Albin. She was an avid sports fan who loved watching her two favorite teams play the Atlanta Falcons and New Orleans Saints. She enjoyed cooking, watching her game shows and listening to gospel music on TV. Mamie also enjoyed spending time with her family and grandchildren. Pastor Tim Payne of Momentum Church will officiate. The family will receive friends at 11:30 am with a service following at 12:30 PM on March 26, 2019. Interment will follow at Barrancas National Cemetery, NAS Pensacola, Florida. A special thanks to Dr. Peter Berez for taking such wonderful care of our mother. He is truly an amazing doctor. The nurses and staff of Covenant Hospice who helped the family through this difficult time, their care and compassion it was innovative quality. Also Special thanks to D.J. and Dee for their undivided attention. May your mother rest in peace with Our Lord. She had a loving husband and caring daughter. It’s always hard to say goodbye. You have many memories to comfort you. David,Danette and entire family. My heart is overwhelmed with the wonderful memories of such a sweet,gracious and warm mother to all. My continued memory will forever be held with the same smile she shared with so many. As mothers go….she was one of the “Best”. I rejoice in knowing I’ll see her again in time. Danette, I’m so very sorry for you, I know that you will miss your Mom so greatly. Although I did not know her but did meet her, she has passed from this life to a greater one. She is greatly admired to have raised such a caring, giving, selfless, hard working daughter as yourself. Call anytime you need any help, even when there is no sound from you but just tears. You are very blessed to have had your Mom for so many years. Giving thanks to God for you and your family. Sending Love to Logan.